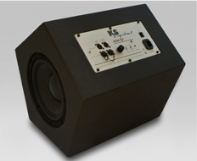 The ultimate powered subwoofer for your KS Digital C-Series studio speakers. The ADM B2 and B3 active subwoofers provide incredible power and extension for your low frequency mixing needs. They are the perfect addition to the Coaxial studio monitoring series (C5, C8, C55, C88) or even the ADM30 when you need deep bass that is accurate and focused. 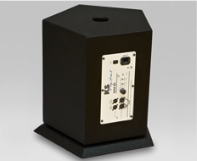 Another first in the industry--KS Digital's exclusive pentagonal design allows for low frequency extension to 25 Hz in the B2 and 30 Hz in the B3, all from a compact enclosure! Now engineers can take full-range small speakers such as the C5's and turn them into a complete 3-way system with a frequency response unheard of in a combined monitoring solution of this size. 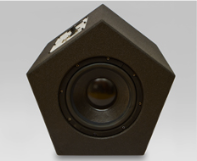 The KS Digital ADM B2 / ADM B3 is a self-powered, highly accurate studio subwoofer. 10" drivers and a 400W amplifier (B2) / 200W amplifier (B3) provide all the power and articulation to drive the deepest low frequencies in dance and orchestral music. Multiple subs can be set up if you need even greater detail and power in the low end. Combined with any C-Series studio monitoring, the most accurate coaxial performance can be achieved across the broadest frequency range available (the C-Series extends out to 28kHz, so adding the B2 gives you accurate low end to 25 Hz!). Simple to set up, designed for power. The fast-acting MOSFET power amp is mounted on the back of the cabinet, as well as the XLR inputs / throughs and sub controls. The B2 and B3 powered subwoofers can also be used with any manufacturer's nearfield monitors, providing full bass extension in a more compact enclosure than any competing sub systems. As with all KS studio monitoring, the KS Digital B2 and B3 are hand-built for you in Germany and come with a signed Certificate of Authenticity, along with a full 2-year warranty. … The ADM B2’s special design, developed over a long period with a series of testing, allows for a very compact size with a frequency response down to 25 Hz. … The ADM B2 is an excellent subwoofer, which anyone who is looking for perfect low-sub reproduction should test for themselves. Dimensions H 44 x W 46 x D 46 cm, 17 1/3" x 18" x 18"
Dimensions H 35 x W 37 x D 42 cm, 13 2/3" x 14 1/2" x 16 1/2"